You are here: Home / Season’s Greetings from the Presidential Fellowship! Season’s Greetings from the Presidential Fellowship! As the semester winded down, the Fellows and advising team gathered together on Wednesday December 5th, for our final gathering of the semester. As per tradition, we had a delicious breakfast potluck. Homemade goodies included homemade egg bake, quiche, cinnamon rolls, Kathy’s famed chocolate chip oatmeal bars (see recipe below! ), and more!! 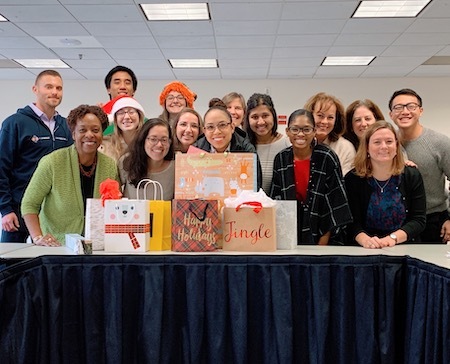 The Fellows and advising team also partook in an annual gift exchange. It was a great opportunity to reconnect after a successful semester and spend quality time together before heading home for the holidays. Thank you to all for a wonderful semester! We wish everyone Happy Holidays and a Happy New Year!